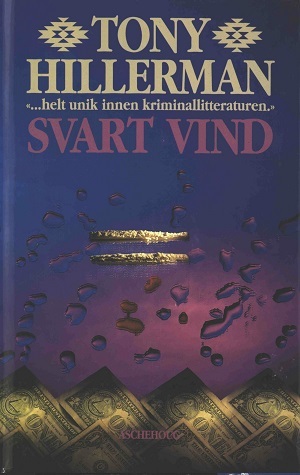 This is the first Norwegian edition of The Dark Wind, which is the fifth Tony Hillerman Navajo Mystery Novel. This edition was published by the Norwegian publishing house, H. Aschehoug & Co. in Olso, Norway. The text was translated from English to Norwegian by Atle Bjørge. The cover illustration was designed by Tommy Pettersen, and it depicts two lines of cocaine on a blue and magenta background surrounded by droplets of water and blood with two rows of US dollar bills underneath. Format: Hardback, 21.2 x 13.4 cm. Binding: Black boards, with a blue geometric design printed on the cover and the same design is printed on either side of the author's name and the title vertically in blue.